Wool is made in follicles located in the skin of sheep, usually. Wool fibers that grow in these follicles are a protein, amino acid. As they grow the protein hardens into keratin, a structural protein. Mostly, the sheep are off-white and so is the wool. Cashmere and mohair (wool) is from goats, alpaca (wool) is from rabbits! Shearing is the process of removing the wool from the sheep. There are different types of wool, fleece (close to the skin) and locks (at the end). After it is removed, the wool needs to be degreased to remove the wool grease which can be processed into lanolin. Wool quality is determined by animal type, fiber diameter, fiber length, crimp level, etc. After it is removed from the sheep, the wool is cleaned and bleached. The sheep’s wool is opened by combing. The fibers are sorted and mixed in an air chamber. The wool fibers are so light they can fly! This is called a blending. The fibers are then carded into parallel untangled lines. This smooth flat sheet of wool is called a web. The web is divided into thin flat strips and the strips are twirled into rovings. The rovings wind onto a spool. They look like yarn but if you pull on them they tear. Spinning into yarn gives it strength, the wool is stretched as it is spun. Woolen yarn is spun to allow changes in thickness so it is fluffier and warmer, but has a messy stitch. Worsted yarn is stretched as it is spun so it is smoother and stronger, with a clean stitch. Wool is 10 times stronger than cotton! The yarn winds onto a bobbin. Now the yarn is woven into wool fabric. The wool can be dyed before or after weaving. If the wool is wet when it is dyed then the fibers will absorb the wet dyes more evenly. Dyeing wool is easy because wool can absorb up to 30% of their weight in water and the dye easily penetrates the fibers, without capillary action. That’s why wet wool sometimes doesn’t ‘feel’ wet. If you hang wet wool it will stretch with the weight of the water trapped inside the fibers. Wet wool smells like wet sheep! Natural dyes, like those made of fruit, are acidic and can easily bond to the wool fibers. Wool pulls moisture away from your body. Wool can keep you warm even when it’s wet! The fabrics can be finished to modify the texture. Wool fibers are crimped and because of the crimp, wool fibers trap/hold air to give it good insulating properties and make it feel soft and springy. Wool keeps you (and sheep) warm in the winter! Merino wool has 100 crimps per inch. Because of the scales, wool can be felted and it appears to shrink. When felted (by rolling the fibers together, adding soapy water or using hot water), the scales on the surface of wool fibers act like thorns and lock together. Hair conditioner is used to keep the scales on human hair flat and avoid tangles. Wool can also be shaped by needle punching…with very sharp, small needle to knot the wool fibers together as the needle moves up and down. Wool can also be shaped by knitting…with very dull, big needles to loop the wool as the needles move in and out. What does wool look like? It’s fuzzy. What does wool smell like? A sheep. What does wool feel like? It’s soft, it’s warm, it’s scratchy. What sound does wool make? Boof! What is wool made of? Wool fibers are the sheep’s hair that is shorn in the summer. Where does wool come from? Wool comes from sheep who live at the farm. What is the power of wool? Wool can change shape if it gets wet. How is wool made? The wool fibers are combed, spun or felted into yarn or felt. What is made of wool? Sweaters! Hats! Socks! Shoes! If you were made of wool, what would you do...? If you’re ready…you can make-your-own Woollard, to help you remember his story and it will remind you to be happy and curious whenever possible. Step 1. First…get some sheep! If you can’t find any sheep, you will need the following supplies: wool roving, cotton string, hot water, dish soap, blueberry juice or hibiscus tea, tea strainer, drinking glass, sewing needle, old towel, plastic bag, a few happy and curious 5-year-olds and 1 teacher, parent or qualified adult. Step 2. Make the wool fly! It’s wrinkled and messy because the sheep have been rolling in the grass, dirt and mud. Separate the fibers in the wool roving until you can blow on it to make it fly. Step 3. Smoosh the fibers. Start rolling the fibers the size of a baseball, a tennis ball, a golf ball, a very small rock. Roll and squeeze lightly until the fibers are knotted together. Step 4. Make it soapy! Dip the wool ball into cold soapy water. 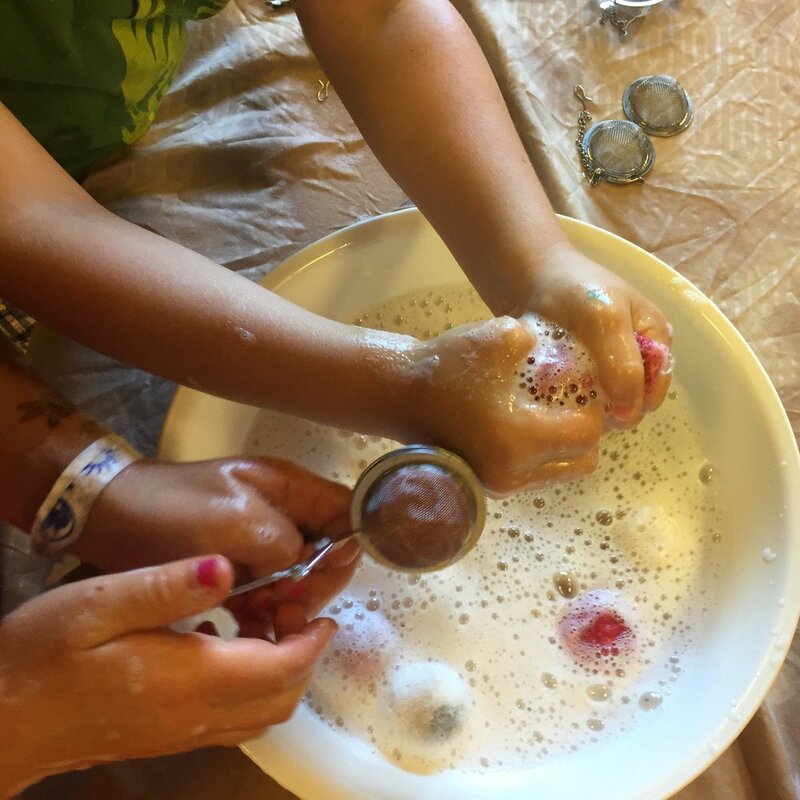 Gently roll and squeeze the ball between your hands to make the soap bubble. Push a little bit harder every time you roll. Step 5. Add hot water! Dip the wool ball into ‘hot’ soapy water. Gently roll and squeeze the ball between your hands to make the soap bubble. Push a little bit harder every time you roll. Step 6. Add some color! Use a fruit juice (blueberry) or tea (hibiscus) to dye the wool. Heat the juice/tea and add salt to make it easier for the wool to absorb the juice. Don’t forget to dye some string too! Step 7. Finally...get an old towel! Remove the wool ball (and string) from the juice and roll it in a dry towel or a few paper towels to remove the excess water/dye/soap and little bits of blueberry. Step 8. One more thing! Use some extra string to stitch a W onto your Woollard ball and leave about 12 inches hanging loose on each side of the ball to make Woollard into a pendant, keychain or bracelet. Ask the students to pick one of these questions and write a story...inspired the the material's superpower or weakness. Is wool...faster than the clouds? Is wool...stronger than rain? Is wool...lighter than air? Is wool...heavier than the sun? Is wool...louder than ice? Is wool...softer than rocks? And why? Ask the students to answer each of these questions and draw the answer...focus on simple lines that express the idea and highlight the material's properties. Where does wool come from? How is it made? What can you make with it? What can wool do? Does wool have a super-power? When does wool need help? Would you want to be friends with wool? What would you do together? Give the kids a piece of wool to hold in their hands and talk while playing with the wool...in soapy water, on the floor, in the air, etc. What does wool sound like? When you drop it? When you roll it? What does wool feel like? When you squeeze it? When you kiss it? What does wool smell like? When it's dry? When it's wet?